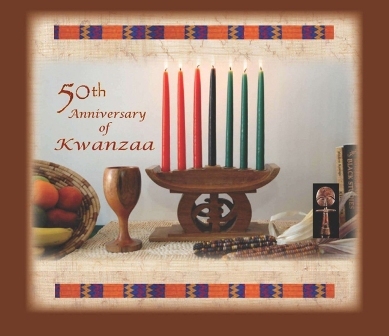 The 50th anniversary of the pan-African holiday, Kwanzaa, of necessity brings added focus and emphasis on its customary call for remembrance, reflection and recommitment. We remember our history and the legacies left and the people who made and left them for us and the world. We reflect on the expansive meaning of being African in the world, on the context and issues of our times, and on our way forward in struggle to forge a future responsive to our needs and interests as well as those of the world. And we recommit ourselves to our highest values, to our most anchoring, elevating and liberating practices, and as ever to the good of our people and the well-being of the world. At this historical milestone and marker, it is good to remember and reflect on the origins of Kwanzaa, not only in the ancient African festivals of harvest and shared good, but also its origins in the relentless and righteous struggles of the Sixties, i.e., the Black Freedom Movement for freedom, justice, equality, and power of our people over their destiny and daily lives. For deeply embedded and ever-present in the celebration of Kwanzaa and the practice of its founding principles, the Nguzo Saba, is the constant call for and commitment to striving and struggling. Here, I use striving and struggling interchangeably, with the meaning being exerting great and focused effort to achieve, excel and advance. For the struggle, as we imagined and waged it and continue to do so, is not only to defy and defeat the oppressor, but also to overturn ourselves, removing from ourselves the legacy of oppression, clearing social space in which we can live, love, work, build and relate freely, and striving diligently then to come into the fullness of ourselves. The 50th anniversary celebration is also in honor and thanks to our people, African Americans and African peoples everywhere. For it is they who embraced Kwanzaa when it was offered to them, received it as their own, nurtured it and made it the national and international celebration of our African selves and the history and culture that grounds us and gives us identity, purpose and direction. Honor and asante (thanks) are also due to my organization Us, the critical context in which Kwanzaa was conceived and created, first accepted, first practiced and begun as a living tradition. Moreover, homage and honor are due to the Black Liberation Movement which embraced and spread the practice of Kwanzaa, taught the values, the Nguzo Saba, and used these principles to undergird and inform a myriad of programs and projects of liberation, and family and community building. Kwanzaa is clearly a celebration of family, community and culture, but it is also a celebration of freedom, an act of freedom and an instrument of freedom. It is an act of freedom in its recovery and reconstruction of African culture, our return to its best values and practices and our resistance to the imposition of Eurocentric ways of understanding and engaging the world. Kwanzaa was also conceived as an instrument of struggle, to raise and cultivate the consciousness of the people, to unite them around principles that anchored and elevated their lives and involve them in the struggle to be themselves and free themselves and build the just and good world we all want, work for and deserve. And thus, Kwanzaa is a celebration of freedom, of the freedom struggle itself in which Kwanzaa is grounded, a celebration of our choosing to free ourselves and be ourselves, as Africans, and to rejoice in the richness of our history and culture of awesome and audacious striving and struggle. Let us hold fast, then, to our African value system, the Nguzo Saba, that has won the heart and minds of millions throughout the world African community. The Nguzo Saba, The Seven Principles, begin with the principle of Umoja (Unity). For we come into being and best express and develop our humanity in relationship. Although others may teach hate, hostility, alienation and animosity, we must raise up the essentiality of rightful relatedness, principled togetherness and an at-oneness with each other and the world which promises mutual respect, peace with justice and the shared good of the world. The principle of Kujichagulia (Self-Determination) reaffirms the right and responsibility of every people to control their destiny and daily lives and to be respected as a unique and equally valid and valuable way of being human in the world. Moreover, the principle of Ujima (Collective work and Responsibility) reaffirms that together we must build the good world we want and deserve to live in and that we must share the good we cultivate and harvest together. It speaks of an ethics of sharing of the good of society and the world. Kuumba (Creativity) commits us to work to build a world that is more beautiful and beneficial than what we inherited. And it reminds us of the ancient ethical imperative of serudj ta to constantly repair, renew and remake the world as well as ourselves. For we are indeed injured physicians who have it within themselves to heal, repair, renew and remake themselves. But we can only complete the process by remaking, i.e., eliminating and rebuilding, the social source of our injury and wounding, in a word an oppressive society. And finally, Imani (Faith) rejects the idea of a funded faith and a religion in service to oppression. Indeed, it teaches us to believe in the good, the right and the possible and in the righteousness and victory of our constant striving and struggle to expand the realms of freedom, justice and peace and lay a solid basis for human flourishing and the well-being of the world. 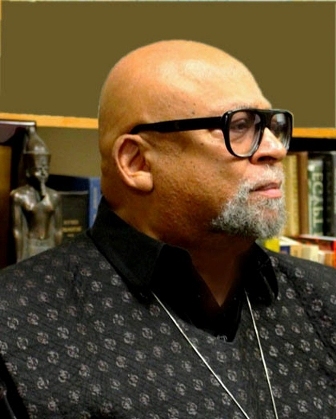 Dr. Maulana Karenga, Professor and Chair of Africana Studies, California State University-Long Beach; Executive Director, African American Cultural Center (Us); Creator of Kwanzaa; and author of Kwanzaa: A Celebration of Family, Community and Culture and Essays on Struggle: Position and Analysis, www.AfricanAmericanCulturalCenter-LA.org; www.OfficialKwanzaaWeb­site.org; www.MaulanaKarenga.org.